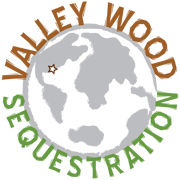 Valley Wood manages a carbon sequestration project, which uses a managed-forest protocol. Roughly 64,000 acres of forest land in Georgia and South Carolina have been enrolled in a carbon sequestration program with the CCX Registry. Carbon sequestration scientifically measures the net amount of CO2 stored by a sustainably managed forest as it grows and matures. Through complex quantification and certification processes, Valley Wood calculates the carbon stored on timber lands. Sustainable forestry is the management of forests to meet the needs of the present without compromising the ability of future generations to meet their own needs by practicing a land stewardship ethic which integrates the reforestation, managing, growing nurturing and harvesting of trees for useful products with the conservation of wildlife, plants, soil, air and water quality, and aesthetics.